Recently, I decided to become an even bigger Brooklyn cliche by learning to can foods. This started when I acquired entirely too many peaches a couple of weekends ago, in the course of a visit to a farm in Dutchess County. In order to preserve them, I downloaded “Canning for a New Generation” to my Kindle, and began reading about how to can. After a practice batch of peaches in syrup, I began to get the hang of it. I have now successfully “put up” a half dozen jars of peach jam (with apple pectin, of course), three and a half pints of classic cucumber relish, three pints of “Dilly Beans!”, and two quarts of Quick Kosher Dills, using apple cider vinegar. This eliminated a lot of the surplus produce from our CSA, who seem to be having a bumper crop year of cucumber and peaches. It also took advantage of local sales on seasonal vegetables. 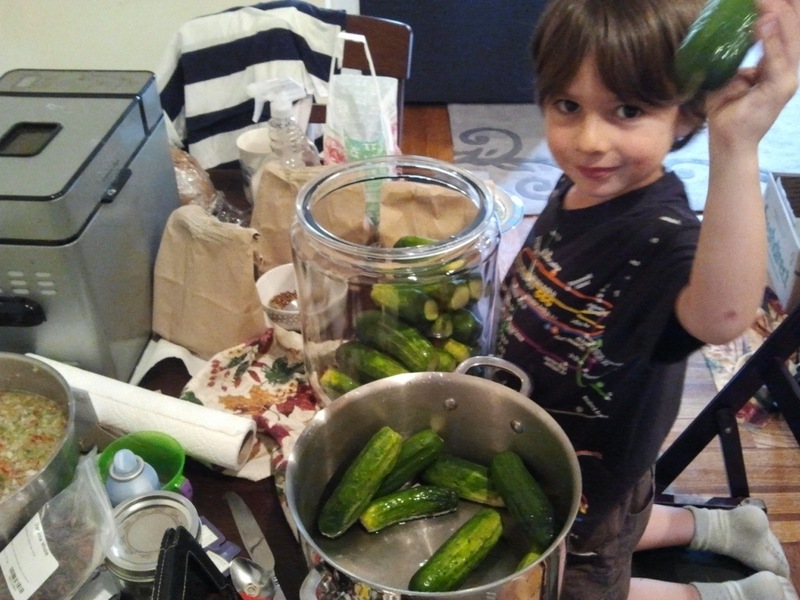 So this weekend, I took advantage of a sale on Kirby cucumbers, and we put up a crock of pickles. 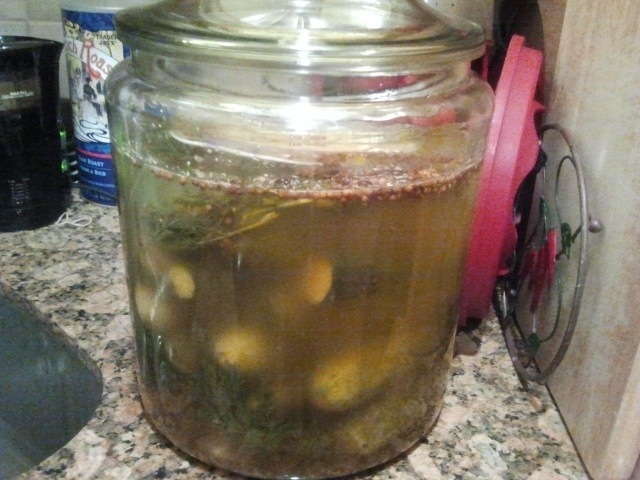 Two days later, the jar is starting to smell a LOT like pickles. Two more weeks, and we will be ready to put pickles in jars, pasteurize them, and prepare for distribution to friends and family. And, of course, eat them ourselves. Because, as Ben tells us repeatedly every chance possible, he loooooooves pickles. And I’m not sure how it is I regressed into being an L.M. Montgomery character, despite living in Brooklyn in 2012. First I started baking our own bread, now I’m making pickles. If only I knew how to properly sew, knit and garden, I’d be all set to live in a PEI settlement circa 1890. As it is, I will just have to be a part time urban homesteader in New York City, in a very modern age.